"This is a very flavorful dish that my brothers named Death By Garlic. Warning: If one person has this, you'd better all have some! Beautiful flavor and zest. (I like to brown kielbasa sausage and toss it in, then sprinkle feta cheese on top. Yum!)" In a pan, brown garlic in oil. Add salt, pepper and parsley and remove from heat. 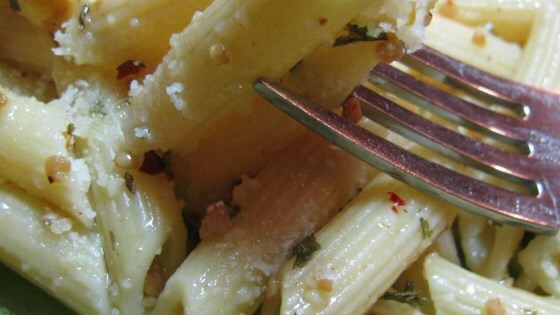 Toss penne pasta with garlic mixture and Romano cheese and serve! This was good but needed much more cheese than the recipe calls for. Next time I will add meat and/or veggies because I did feel it was missing something. Great base recipe though! This recipe is completely awesome! Loved it! I grilled up some chicken with lots of red pepper, I thought the spicy chicken went really well with the garlicy pasta!! Yummo! !